It’s a valid question. After all, the Red Line runs right underneath the Cahuenga Pass adjacent to the Bowl. With thousands of Angelenos and others making their way to performances throughout much of the calendar year, why wasn’t a subway stop constructed at one of Southern California’s leading attractions? The Metro Transportation Library and Archive periodically dives into the history behind “future stations of the past” for a closer look at transit stops that were planned but never built. 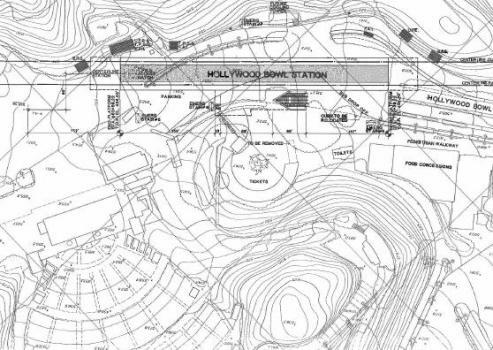 This week: The story behind the on-again, off-again plans for a Metro Rail station for the Hollywood Bowl can be found on the Library’s Primary Resources blog. Hint: it wasn’t just a money issue. Question for Source readers: do you consider the Hollywood & Highland station a viable option for getting to the Bowl? It’s about a .8-mile walk. I’d like to think this could alleviate some of the traffic that clogs the Cahuenga Pass during Bowl events, but then imagine that the rush of people to get to and from the Bowl before and after shows could be overwhelming as well. More importantly, this stop would barely be used except for those hours… and seems an awful expense just for a single venue. Same reason there’s no station at Dodger Stadium, the costs don’t justify a venue that isn’t used year-round. Though it would be cool if the eventual northern extension of the Crenshaw LRT Line could dead-end there. One does not have to walk to the Bowl from the Hollywood/Highland station. There is a free shuttle with proof of MTA use (I assume owning a TAP card is proof enough, anyone know?). Else the cost is $2.50 (return trip included). Works great, and they take you to the top of the hill by the ticket booths. There are several buses, so you don’t need to time your trip. I really think the existing station is close enough. .8 miles isn’t that long of a distance to walk. Not to mention walking is good for your health. I went to the bowl this summer and took the red line. I called MTA and the ability to get from Hollywood/Highland station to the bowl flummoxed me. First there is no normal MTA bus that would stop at Odin as one would assume, and then the MTA trip-planner tells you to take some other bus that is a special shuttle from some parking lot near H/H, or some other bus that goes in the general neighborhood area, but doesn’t really stop at the bowl. In the end no one seemed to know how to take public transit to one of LA’s biggest summer destinations. Very weird. I ended up walking the .8 mile hike and found it easy, but often the public is loaded down with picnic supplies or may have guests that are older who cannot sprint up Highland. Though this was either not the case early in the summer, when I went to the bowl, or the operator was misinformed, but I have found out on the MTA website that there is a METRO LOCAL LINE 156 (VAN NUYS ORANGE LINE STA) heading north that takes you to odin. Sorry. If the pedestrian experience was safe and inviting, people would gladly walk .8 miles. Unfortunately many streets in LA are designed to discourage walking. The shuttle between the Bowl and Hollywood & Highland is absolutely not a good enough solution IMHO. First, the bus is hard to find. The specific location within the H&H complex is not listed anywhere on the Bowl website. Having found it, the most recent time I took this shuttle, all of us waited in a dark unlit (turned off) bus for quite a while. Eventually, the driver took us up, but the circuitous route took a while in rush hour Hollywood Blvd traffic. Highland isn’t exactly fun, either. The ride back can be a nightmare. I’ve been stuck on an absolutely JAM packed standing room only shuttle for insane amounts of time as the bus inches through COMPLETELY gridlocked Southbound Highland traffic at night. The right turn at Hollywood Blvd is severely impacted by constant nighttime pedestrian traffic, making the journey time ridiculously long. I’m amazed how badly it’s done, frankly. I’ve taken the Red Line to the Bowl before and found the shuttle from Hollywood and Highland to the Bowl quite easy. It was, however, difficult to find within the H&H center (no signage that I noticed). I walked back down the hill after the show, the lines for return shuttles were absolutely ridiculous. While the walk was fine for me (guy in his 20s who went to a country rock show), I wouldn’t see too many people doing it after an LA Phil performance with picnic supplies or nicer clothes. I’m generally a fan of destination-based transit, but this stop would really only have been used during Bowl events, which are only during part of the year. It would have been a huge expense for something that wouldn’t have served many of the regular riders. That being said, if the LA PHIL was planning on contributing to the cost (which the article said they were), it would have been great to have been able to include it. It’s becoming increasingly important for venue/destination operators to see the importance of transit to their destinations and (while I don’t think it should be necessarily required of them) contribute to making simple transit connections a reality. If it were built no one will ride it just to get between H&H and HB because it’ll be a rip off to pay $1.50 for 0.8 mi. If they fix the fare system so transit riders pay cheaper for that short ride then I can see it working as many people go to H&H for dinner after an event at the HB. Having a direct station at the HB may also entice more events to happen there year round than just several times a year. But fares needs to be fixed first. Bowl events happen 6 nights a week all summer long, but that’s probably not enough to justify a stop 0.8 miles closer that would essentially be useless at any other time. The bowl shuttle got a lot worse this year, since it now heads east through congestion on Hollywood to Highland, instead of directly up to Franklin as it used to. That one block seems to take 10 minutes some nights. On the way back, the crowds are too large for the buses to handle, so walking is generally the best option. Maybe a Pedestrian Tunnel linking the Hollywood Bowl with the Hollywood and Highland Station might be a good idea here. Have the tunnel open only during Hollywood Bowl events. A flat .8 mile walk is not nearly as bad as hilly one and the experience might be more pleasant as pedestrians will not have to interact with the automobile congestion after Bowl events. .8 miles, give me a break I sometimes have to walk 2 miles when I miss the 183. I remember the press reports and politicians and SCRTD board members saying at the time that the primary reason the Hollywood Bowl station was dropped was due to . . .
That was the “killer” and basically the SCRTD was told by engineers that could could have one or the other, but not both. It was decided that H&H would have heavy year round use, while the Bowl would have use mostly during concerts, and there are more events the the LA Phil at the Bowl. Fine. But what really gets me ticked is that after all this time we have no “people mover” type system serving as a rail shuttle to the Bowl and H&H station. And.8 miles is out of the question for many older people who are willing to take transit, but need to be dropped off much closer to the gates. People on this forum sound VERY much of agism. Sad. My family used to take the Bowl park-n-ride bus; I would daresay that for a lot of riders, that was the ONLY Metro bus that they ever took. I don’t know if the Bowl needs its own “event-only” subway station, but I do think that better access from Hollywood/Highland couldn’t hurt. I like the idea of a pedestrian tunnel. Also, I think you have to take into consider the average age of Bowl ticket holders AND the likelihood of carrying picnic/ bento dinners to your seat. Yes, James Fujita, my family too took those Bowl Park and Rides nearby , and I, too took those Bowl Park and Rides from as far as Fullerton, and ironically, they work VERY well, much more attractive than an EXPENSIVE crime potential UNDERUSED pedestrian tunnel, as the buses dropped you off right at the ticket area and just a short walk down to the staging area on Highland after the concert. Those buses are superior to just about any suggestion made on this thread so far. The only ATTRACTIVE solution is some type of rail shuttle, something like the Seattle monorail that connects Westfield Shopping Center with Seattle Center, only NOT monorail, but something smoother and nicer. This would also make the Hollywood Bowl Museum accessible during the off-season, and restaurants, even a models retail area featuring restaurants ought to be encouraged to create off-season traffic and good use of the rail shuttle.